BM1203 (EU-ROS) is a COST Action within the Biomedicine and Molecular Biosciences Domain that covers all areas of medicine as practiced in Europe and basic, preclinical and clinical medical research developed to materialise the “bench to bedside” concept. COST is an intergovernmental framework for European Cooperation in Science and Technology, allowing the coordination of nationally-funded research on a European level.COST has a very specific mission and goal. It contributes to reducing the fragmentation in European research investments and opening the European Research Area to cooperation worldwide. As a precursor of advanced multidisciplinary research, COST plays a very important role in building a European Research Area (ERA). It anticipates and complements the activities of the EU Framework Programmes, constituting a “bridge” towards the scientific communities of emerging countries. It also increases the mobility of researchers across Europe and fosters the establishment of scientific excellence in the nine key domains. The mission/objectives of EU-ROS is to advance this important area of biology and medicine, EU-ROS will bring together multi-disciplinary experts to cross-fertilize ideas and to enhance the competitiveness of European research. By applying new approaches, sharing tools and discussing latest discoveries we aim at generating an advanced knowledge at the molecular mechanistic and cellular level, which will translate into novel applications for medicine or crop science. With EU-ROS, we overcome the fragmentation of European research on ROS, and the translated outcome will contribute to the benefit of European societies’ economic growth and wellbeing. Life requires oxygen for respiration and energy formation by every human cell. Plants in turn generate oxygen, forming a symbiotic cycle. 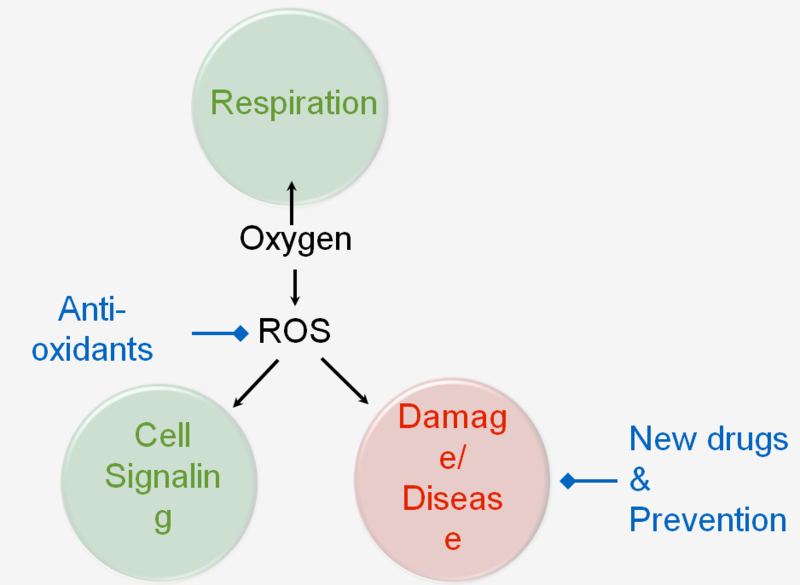 However, from oxygen also reactive oxygen species (ROS) can be formed. ROS have two faces, a bad one and a good one; they can be chemically very aggressive (like bleach), do serious harm to cells and cause disease; however, they function also as essential signaling molecules. 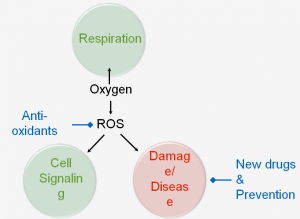 Life with oxygen (aerobic) is thus a fine balance between a need for oxygen and well controlling its side-products, ROS. A thorough understanding of this will open up new avenues of disease treatment (such as in stroke, cancer, inflammation and diabetes) and prevention. However, it is also important to recognize that the current uneducated broad use of so-called anti-oxidants and vitamins is not only ineffective but bears surprising health risks including higher death rates. the high risks of the current broad application of anti-oxidants and vitamins by lay people and recommendations insufficiently trained health professionals.